Stunningly engraved early map of Crete by Boschini. A rare, stunningly engraved, and important 1651 map of Crete by Marco Boschini. The map covers the island in full with rich, almost organically engraved topography. The Lion of St. Mark, a symbol of Venice appears in the upper left surmounted by a crown. A ship's wheel, surmounted by the Doge's cap, the corno ducale, appears in the upper right. Cartographically the map follows on the work of Francesco Basilicata who mapped Crete between 1610 and 1640. Although clearly derived from Basilicata, the map is no slavish copy. Boschini embraces different topographical conventions and adds some 81 new place names, presumably derived from other sources. Unlike Basilicata, Boschini never visited Crete and compiled his maps fully in Venice. Boschini issued 3 significant maps of Crete, a large format map in 1645 (now known in only two examples), the presently offered example in 1651, and another larger format map in 1658. In the year that Boschini composed his first map of Crete, 1645, the island, which was under Venetian control, was invaded by the Ottoman Empire. This began the Cretan War (1645 – 1669) or, as it is often known, the Fifth Ottoman-Venetian War. Most of Crete quickly fell under Ottoman control, but the islands' Venetian capital, the fortress of Candia (Heraklion), resisted under siege for some 22 years until finally conquered in 1669. The outcome of the war was of deep concern to the powers of Europe who had long feared Ottoman, and Islamic, incursion. At that time, the attention not only of Venice but of the whole of Christian Europe was focused upon the fate of Crete. It was the perfect moment for a patriotic Venetian to affirm the greatness of Venice in her struggle against la potenza vastissima Othomana and, at the same time, to launch a money-making venture by publishing a volume containing maps, plans and drawings of Crete. 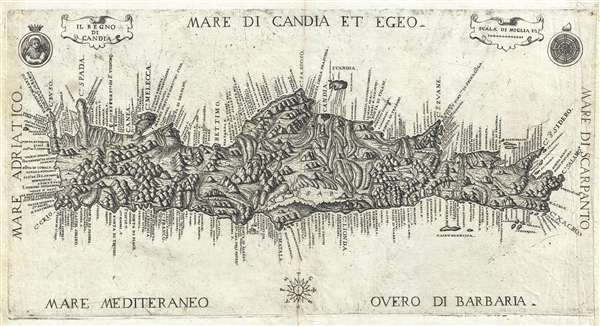 This map was published in Marco Boschini's 1651 Il Regno Tutto di Candia delineato à parte à parte. Marco Boschini (1602 - 1681) was an Italian baroque period painter, engraver, art dealer, and writer active in Venice. Boschini was born in Venice and educated at Palma il Giovane. While Boschini's paintings are today well known, at the time he was primarily an art dealer whose clients included Cardinal Leopoldo de'Medici. In cartographic circles, he is best known for his work on Crete, including a book at least 3 significant maps, all of which were derived from the manuscript maps of Francesco Basilicata. Francesco Basilicata (???? – c. 1640) was a 17th century Italian cartographer and military engineer. Basilicata worked in the service of the Republic of Venice and is known for his maps and drawings of the island of Crete. Little is known of his early life, but it has been suggested that he may have been from Palermo. He lived in Crete during the first two decades of 17th century, in the last days of Venetian hegemony over the island. Basilicata fell in love with the island's rugged scenery and spent the years between 1612 and 1629 meticulously mapping the entire island. His maps of Crete from the foundation for must subsequent maps until the early 18th century. Boschini, M., Il Regno Tutto di Candia delineato à parte à parte, (Venice: Nicolini) 1651. OCLC 158813214. Clutton, E., 'Some Seventeenth Century Images of Crete: A Comparative Analysis of theManuscript Maps by Francesco Basilicata and the Printed Maps by Marco Boschini,' Imago Mundi, vol. 34 (1982), pages 48-65, quote: page 62.